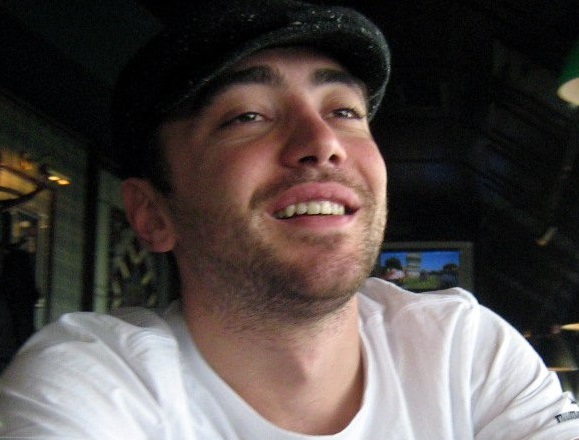 You are parsing the content of the alerts with another notification and/or monitoring tool. You need specific data in the alerts (last resolved IP, the first 100 bytes of the response we received from your server, etc.). 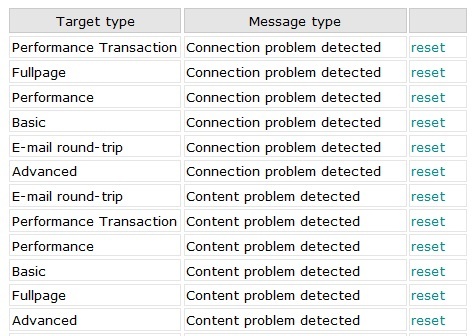 You only want to receive 1 SMS notification (usually up to 160 characters per message) when we detect a failure. Go to Contacts and then click “alert contents”. Once there, you need to choose the notification contact for which you want to customize the alerts, the target type and alert type. If the alert contents for a specific contact are already modified, you will see a modified link on the right hand side of the contact in question. Clicking it will show you exactly which contents were modified and for which target types the alerts are going to be different than the default ones. To get the default alerts for a modified contact, click on the "reset" link next to the specific target and message type. 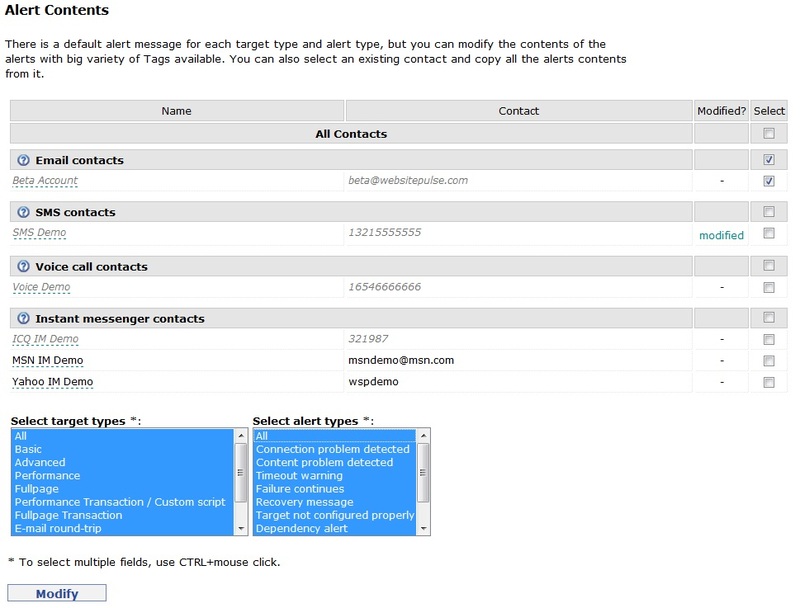 Тo modify the contents for a specific contact but for all target and alert types, select the contact and choose to modify all target and alert types. By clicking „modify“ you will proceed with the customization. Кeep in mind that there are going to be 76 different alert contents which you have to modify if you decide to do that for all types of targets and alerts. The best option here is to modify only the contents for the specific levels of monitoring you use. 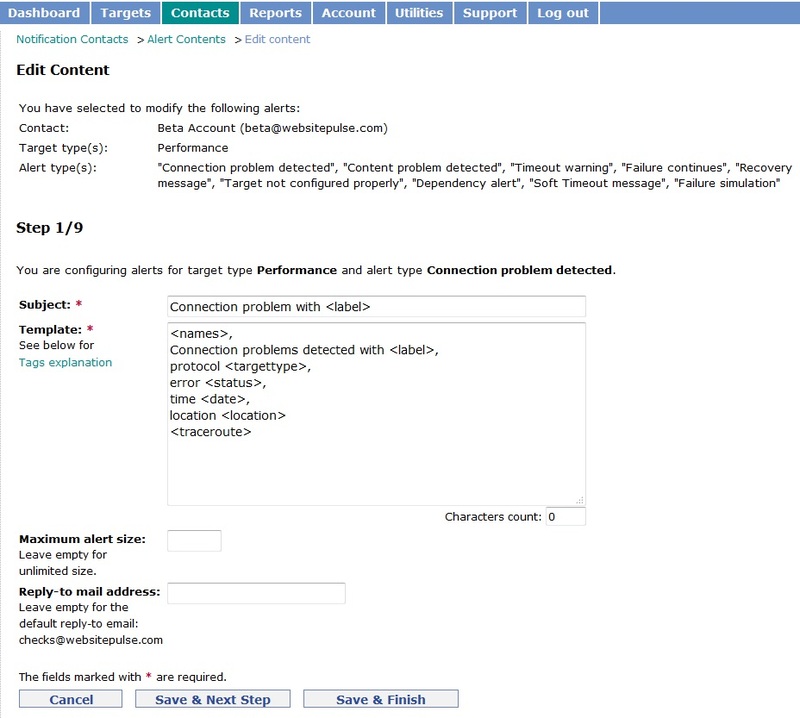 If you have performance targets, for example, and you do not have any other types of targets, there is no point in customizing the alert contents for the other target types simply because you will never receive such alerts. If you follow that advice, you will save a lot of time and you will not be frustrated with the customization process. Here is the actual customization section for the alert contents. At the very top of the page, you will see a list of the contacts for which you want to make the changes. You can select a single contact or multiple contacts and edit the contents simultaneously. 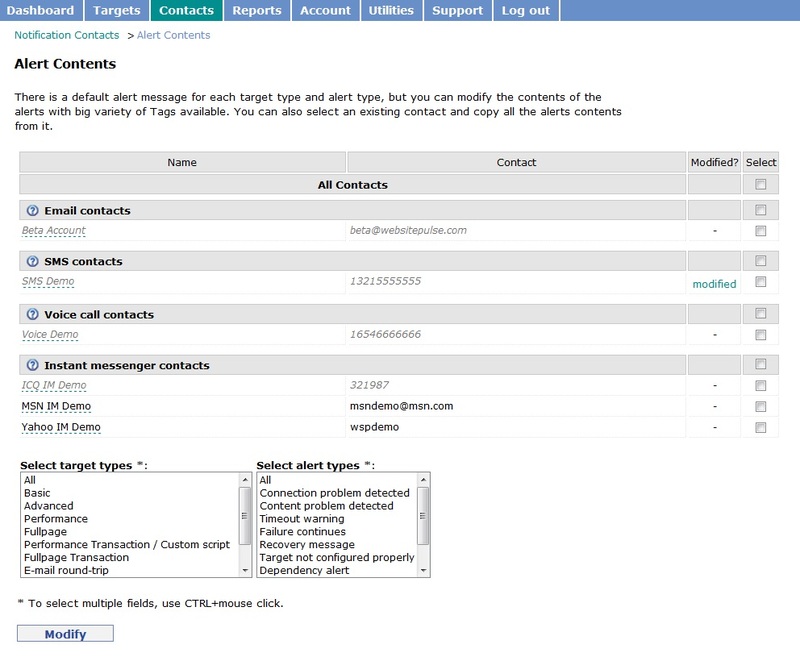 Under the list of the contacts, you will see the target and alert types for which you will be making the changes. You can use tags in the subject and body of the notification messages. I will soon publish a detailed post on the possible tags and the information they will include in the alerts if you decide to add them. You can also set maximum alert size (the number of characters in the alert message) and a reply to a mail address. For the performance target type, there are nine possible notifications and by clicking “save” and “next step” you will be able to customize each and every one of these notifications. You can stop the process at any time and just save the changes you have made so far by clicking the „save“ and „finish“ button. By clicking “cancel” the changes will not be saved and you will be taken back to the alert contents section of your account.